Junk bonds undervalued due to boglehead popularity? Every time junk bonds are brought up here they're dismissed as kind of a pointless hybrid of the risk of stocks and the safety of bonds. The mantra here is that to the extent you want risk buy stocks and to the extent you want security buy (high quality) bonds. This implementation of buy-and-hold isn't just popular here - on reddit's investing forum, anyone asking what to do with their money is going to be advised the same. And I think it's a good strategy. But it means a large segment of the population is ignoring a perfectly good class of investment vehicle just because it's not the fashionable way to go. Would that imply junk bonds are going to be undervalued because of a lack of demand? Is there more money in the hands of Bogleheads biased against junk bonds, or more money in the hands of "income investors" who are biased in favor of junk bonds, who choose high yield funds because their budgets require a yield of X that investment grade bond funds do not provide and who ignore the erosion of principal and therefore income in high yield funds? Especially when interest rates are low (which they still are, even if they are no longer zero), I think there is a lot of yield-chasing behavior. But it means a large segment of the population is ignoring a perfectly good class of investment vehicle just because it's not the fashionable way to go. Would that imply junk bonds are going to be undervalued because of a lack of demand? First, I think it's not quite accurate to say junk bonds are being ignored (much less ignored because they are unfashionable). Rather, many of us simply point out that lower "perfectly good" they might be as an investment vehicle they are essentially redundant for most investors. And while many Bogleheads might recognize this, there is a world full of investors who focus on passive yield instead of total return. The five largest junk bond ETFs have taken in nearly $7 billion in fund flows this year already. I have no opinion about whether they are undervalued or overvalued at this point, but junk bonds certainly are in no danger of being ignored. It shouldn't matter whether Bogleheads or investors as a whole are biased against junk bonds. As long as sufficient capital exists to purchase them with an appropriate spread, they can be accurately priced. If the spread grew too large, for example, hedge funds could purchase large numbers of junk bonds and sell interest rate futures and/or buy options and/or issue debt, then correct for default risk through options or short sales of an equity interest (such as issuer stock). But it means a large segment of the population is ignoring a perfectly good class of investment vehicle just because it's not the fashionable way to go. I think you are mistaking the people who post about investing on Bogleheads and Reddit for a large segment of the population. If it wouldn't be too much trouble, can you explain this with an example? Undervalued... ummm junk bonds have been selling like hot cakes over the last decade as people have loaded up on risk to chase yield due to low interest rates. It's not popular on this forum, but junk bonds are very popular and arguably overvalued in the actual market right now. And even on this forum, I think most people would agree that they can serve a valid purpose in a portfolio (just like every other asset class on earth can), they just aren't something that is ever going to be a blanket recommendation to a newbie (which is what the target audience of this forum is). You might be overestimating the impact of this forum on capital markets. Beliavsky wrote: ↑ Is there more money in the hands of Bogleheads biased against junk bonds, or more money in the hands of "income investors" who are biased in favor of junk bonds, who choose high yield funds because their budgets require a yield of X that investment grade bond funds do not provide and who ignore the erosion of principal and therefore income in high yield funds? Probably less confusing to simply assume that comment was basically making the case for efficient markets and the philosophical case of fair pricing being supported by supply/demand. In practice, a large part of the population of private funds buying high yield debt aren't really hedging much. HY debt is primarily a credit risk instrument, so hedging interest rates directly is rare. But just to provide the example: Think about an investment manager who manages a fund that seeks invests long in single name high yield bonds, but the fund's mandate is such that return volatility is to be less than the broad HY market. The fund might then hedge some % of the long exposure by buying CDS (insurance) on the HY index. If the market goes up the expectation is the longs make more than the hedge (whether by security outperformance, but also because it's unlikely to be fully hedged). If the broad market tanks the fund would expect that the longs will lose less than the index hedge. Junk bonds yield more than Treasuries because some of them will default. Defaults amount to a loss of principal, and defaulted bonds are no longer paying interest. 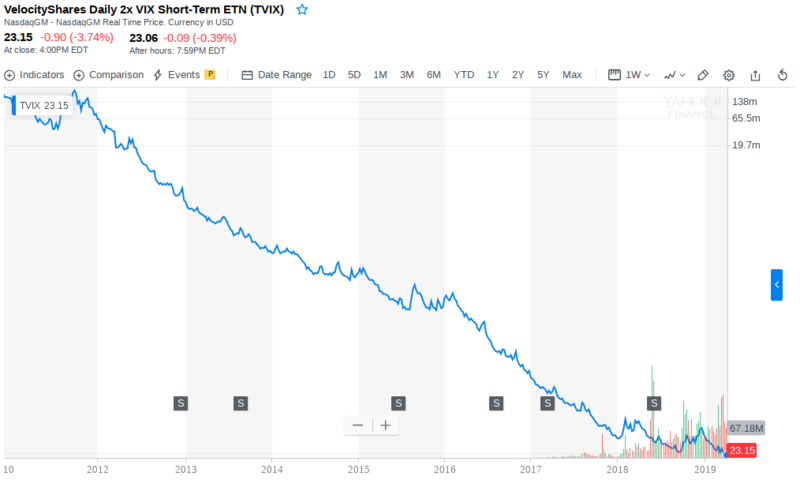 VWEHX, the Vanguard high yield fund, avoids the lowest quality junk, but its share price has declined gradually over time. It's true that junk has a generally low reputation here, my impression. It's reinforced by the opinions of some popular personal finance writers who don't like junk. Sometimes the anti-junk arguments is overstated both logically (basically same market which prices junk, investment grade and stocks is somehow inefficiently rigged against investors in the first category but not the other two ? ), and compared to the historical record. The Vanguard junk fund VWEAX (in Admiral form) had higher Sharpe Ratio than the Vanguard S&P Index fund from the late 80's to when the comparison was done in 2015. Moreover since it had significantly less than 100% correlation with either stocks or treasuries, portfolio's could be constructed of all three, S&P, VWEAX and treasuries, that dominated S&P/treasury only portfolio's (higher return for same std dev of return or lower std dev for same return). Although, this effect was only significant for portfolio's of fairly low stock %'s, like 50% and below. Very high stock risk portfolio's are popular on BH forum and for them junk makes less sense. In the limit if you are 100% stock, and don't want leverage, then you wouldn't want junk. So the idea that junk is 'the inferior asset' sometimes promoted on this forum is not well founded in history, especially for grades in the B's, particularly BB, that are emphasized in the Vanguard fund. Besides needing an explanation how the huge junk bond market could be inefficient when the stock and investment grade markets are believed to be highly efficient. However I really doubt the exaggerated anti-junk feeling sometimes expressed here has much effect on the whole market. I would certainly not assume it pushed junk bonds down to inefficiently *low* prices. That's even a huge understatement. Bogleheads is such a teeny tiny part of the investment world it's almost humerous. There's an investing strategy that hedge funds can use when they believe that junk bonds are undervalued. It's called capital structure arbitrage: buy the junk bond and take a short position in the stock (either short stock + buy call option if the implied volatility is high, or buy put options if the implied volatility is low). If the bonds aren't paid in full, the short position pays out, so the downside of credit risk gets hedged away. On the other hand, if the company is able to pay off their debts, then the credit spread on the bond pays for maintaining the short position in the stock. You can reason backwards from the existence of the arbitrage trade into believing that the asset involved is fairly priced. If junk bonds are actually undervalued, hedge funds can drive up their prices until they're fairly valued again, making billions of dollars. Basically, efficient market hypothesis applies here, since the corporate bond market is liquid enough and supports short sales. So, given that you think junk bonds are fairly priced, why would individual investors want them? Compared to institutions, these people have higher borrowing costs, so they should generally prefer strategies that use less capital for a given amount of risk. Corporate bonds are essentially risk-free bonds + small amount of stock-like risk + compensation for taking on credit risk. It's not capital efficient at all to use as an investment for the kinds of goals investors have. 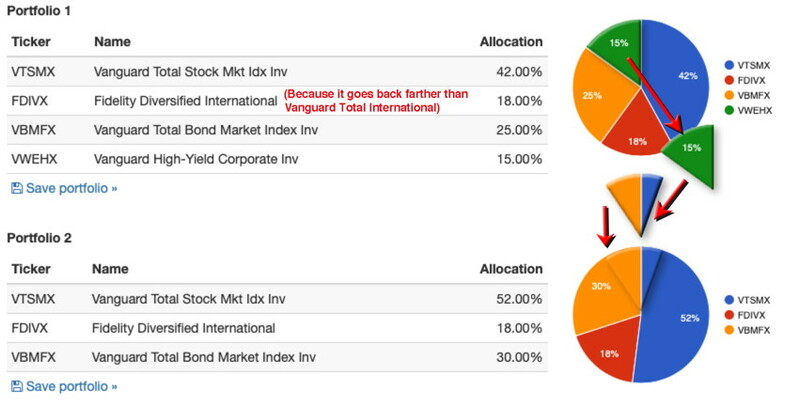 For what it's worth, about 10% of my fixed allocation is in HY (Vanguard & Artisan HY). Thank you for the explanation. I assume something must increase the share price at some point or else the fund would simply decline into oblivion. My son has a new 401k with the T. Rowe Price High Yield Fund [PRHYX] as an option. I understand it is otherwise closed to new investors. He asked me about it with a "hey mom, I like this high yield idea" so we're reading up on high yield bond funds. He's 26 years old, AA of 90/10 to 80/20, mostly with Vanguard index funds. Anytime I've looked at it, it just doesn't seem like the modest increase in yield compensates long term for the material default risk. If the spreads were large enough I may consider it. Also having seen first hand companies with absolutely zero prospect for financial survival get loans at 13% just convinces me there is a lot of money out there looking for a home, no matter how ugly the prospects are. I assume something must increase the share price at some point or else the fund would simply decline into oblivion. Of course, TVIX wasn't actually trading at $106,675,000.00 per share on Sep 26, 2011. Over the years, TVIX has had six reverse splits, five of which were 10 to 1 and one of which was 25 to 1. So one share today used to be 2.5 million shares back in September 2011. 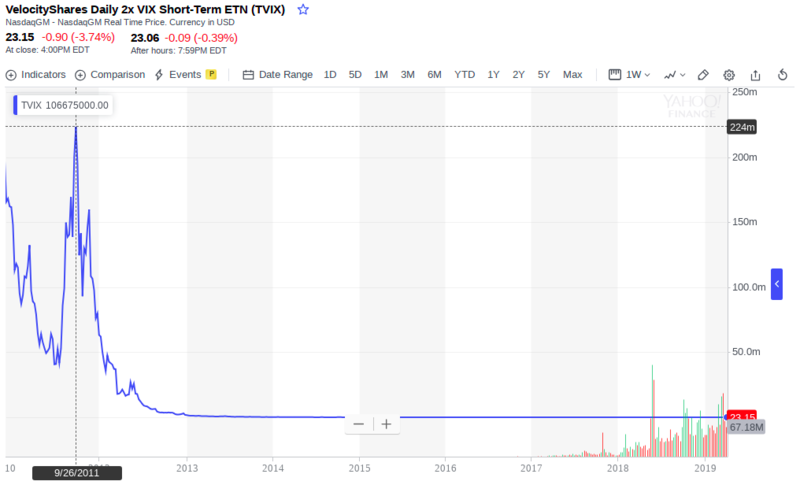 If you look at a logarithmic chart you can see that TVIX's long-term price movement is more or less an exponential decay, which I guess is by design since TVIX is mainly meant for short-term trading. He should absolutely not invest. HY/ junk bonds are attractive at one point in the stock market & economic cycle. When it is all going to heck-and-a-handbasket and the market is discounting an apocalypse. This point was reached in early 2009. At that point, the "risk premium" of the higher yield attached to HY bonds is very high and if the economy improves then it's likely investors will do very well as 1). interest rates will fall (benefits all bond investors) and 2). the "credit spread" the higher yield that HY bonds pay over regular bonds, will itself also fall as investors realize bond borrowers will not default by as much as expected. HY bond funds thus have equity risk - they trade in part like stocks, and part like bonds. For high equity portfolios, an investor is better off holding low credit risk bonds (US Treasury bonds) which provide a "ballast" during bad economic and market times. In math-speak by adding a more uncorrelated asset to the portfolio, you improve portfolio efficiency (risk-return tradeoff). In more plain English you want something that usually zags (US Treasury bonds) while the rest of the portfolio (stocks/ equities) is zigging. That makes for a more comfortable ride and gives the investor ammunition to buy stocks when they are down and conversely a discipline to sell stocks when they are up. Yes. Another way of saying that is credit spreads are quite small. The premium awarded to investors for taking on credit risk is relatively low. "Cov lite" lending - loans and bonds with few protections for investors - is the large majority of all credit out there, now (another bad sign). Whereas one is more sanguine about the mortgage market due to strong restrictions imposed post the Crash, the corporate credit market (as well as direct personal lending, & car loans) appears to be quite stretched and waiting for some road accidents. Try some actual PortfolioVisualizer backtests. Use some proposed portfolio that really makes sense to you, that includes "high-yield" bonds, then replace them with a mixture of about 2/3rds investment-grade bonds, 1/3rd stocks, and see how much difference it makes. 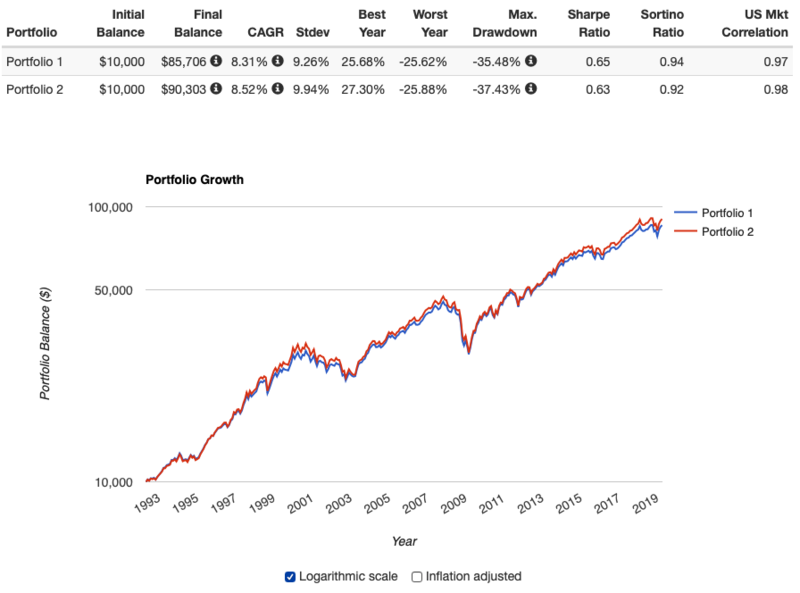 For example, Portfolio 1 is the result of taking a Bogleheads 60/40 three-fund portfolio, with 30% of the stocks in international, and then first swapping Total International for a Fidelity international stock fund in order to get an earlier inception date, and then swapping 15% of the portfolio out of Total Bond and into the Vanguard "high-yield" bond fund. Portfolio 2 is portfolio 1 with the high-yield bonds, in turn, replaced with 10% Total Stock, 5% Total Bond, so we are back to three funds again. Now go ahead and count the angels dancing on the heads of these two pins, and try to convince yourself that high-yield bonds would ever have made a meaningful difference in the portfolio's performance. Credit spreads are historically narrow, but stock cyclically adjusted earnings yields (1/PE[x]) are quite low also. Styles in lending covenants change, but the market knows that. Junk would have been a much better performing asset if you enter at the right time, but so would the stock market. The corporate credit market could be 'an accident waiting to happen' but the stock market could be also. And on and on. I know many financial and quasi-general press articles make statements about particular markets being over valued* but that just shifts the question to how their journalists know that, which I don't believe they do. It seems whenever junk comes up there are statements like this which implicitly rely on the junk market's pricing being less efficient than that of the stock market. But that's not so obvious in the historical numbers, especially if you consider sub-categories within junk. And one very practical way to slice it is Vanguard's junk fund, VWEAX. That fund de-emphasizes very low rated junk**, but it's a quite practical alternative, cheaper in ER than most other junk funds. In link above that fund's Sharpe Ratio was said to be higher than the Vanguard S&P index fund in 1988-2015. And it had a low enough correlation to stock and treasury returns to introduce positive portfolio effects, though significant only for 50% stock and below portfolios. So again for investors seeking lots of risk without using leverage, which seems common here, a large allocation to stocks and a small allocation to very safe assets is probably best. Again at 100% stocks and barring leverage, there's literally no room for anything else. What I disagree with is the implication that we as investors using public sources of information can determine when credit is mispriced but can't determine when the stock market is mispriced. Which is implied by citing things like narrow spreads or loosened convenants: those are only reasons to avoid the asset if they aren't efficiently priced. * more of a drumbeat in The Economist lately, coming corporate debt problems. OTOH they used to note that the US stock market is 'overvalued by X*10% per the Shiller CAPE' seemingly every time they mentioned that market, but seem to have been embarrassed into more reticence about that lately. Note: I think higher stock PE[x] means lower expected return, like narrower spreads probably mean less risk compensation in excess of expected default losses. Where I think my powers of divination fall short is determining which thing the market is pricing more favorably for me: I don't know. **See Ilmanen's "Expected Returns". He presents info from 1973-2009, p.184, where BB had the best risk adjusted realized return of any rating of corporate debt as compared to treasuries, second was B, third was BBB just within investment grade range. AAA/AA and A were significantly inferior. However in more limited data from 1985-2009 including CCC, that rating had by far the worst results, -2.7%pa absolute realized return v. treasuries v +1.7%pa for BB. AAA/AA, A and B corporates all returned slightly less than comparable maturity treasuries in that later period. These data suggest that 'lottery ticket' pricing effects might make very poor grade junk a consistent long term loser (though 2009 is a really tough year to end a data set). It doesn't support the idea that this is true everywhere on the credit spectrum below investment grade. Start with 100% VTSMX v 100% VWEHX. As in the discussion in the 2015 thread (1988-2015), the data set in your reference has the junk fund with significantly higher Sharpe Ratio, .65 v .54, than total stock market, and <<100% correlation (63%). Therefore (and also considering the whole correlation matrix of junk v treasury and US or foreign stock) we know there would have been portfolios which gave higher return for a given std dev of risk including junk than not including. But in the 2015 thread the noticeably superior ones were at low stock allocations, and still not dramatic. Of course the specifics will depend on historical period, and your calculator doesn't do leverage (the best result for junk discussed in that thread was 120% risk parity portfolio with some risky and some 'riskless' bonds). The weak form anti-junk argument, 'it doesn't make much difference', is reasonable IMO. It's the strong form argument, which implies that average investors can look at a market like junk and determine that it's mispriced when the same people believe they can't do that wrt the stock market, that I disagree with. And that 'strong form' argument does seem to be made in at least some posts on most junk threads here. One might practically argue that if it's reasonable to conclude an asset isn't strictly necessary, then it no long matters if you have a distorted view of it beyond that. And that would also be the justification for you, for example, to never speak up and disagree with anti-junk statements that go way beyond yours, and beyond what's reasonable. But I tend to think that keeping things accurate and consistent is important as a general habit. Classic Bogleheads take their risk on the equity side and use investment grade bonds as ballast. OTOH, using an asset class such as junk bonds helps by using the free lunch of diversification. For example, let's say ABC Corp. has a B credit rating, and its bonds are therefore considered "junk." ABC Corp. has senior unsecured notes that yield 8% until maturing in eight years, and it also has publicly traded common stock. Presently, the risks posed by investing in the senior unsecured notes of ABC Corp. include a deterioration in its finances that results in, or increases the probability of, default ("credit risk"); another is that if interest rates rise, ABC Corp.'s notes will decline in value (as would all bonds) ("interest rate risk"). Hedge Fund XYZ believes, however, that the notes are "undervalued" due to investors' general disfavor toward junk bonds. This means that the market has discounted the notes more than it should, overemphasizing risks such as credit risk and interest rate risk. There should therefore be an opportunity to purchase the senior unsecured notes while buying "insurance" against the key risks, still earning notable alpha. The insurance could include an interest rate swap to cover interest rate risk and put options on ABC Corp.'s common equity to cover credit risk. The interest rate swap would allow Hedge Fund XYZ to make a fixed interest payment to a counterparty in exchange for floating interest payments that change based on a benchmark. Hedge Fund XYZ would fund the fixed payments with interest payments from the senior unsecured notes. Since the floating rate payments received from the counterparty would vary with interest rates, Hedge Fund XYZ has insured against a rise in interest rates--the senior unsecured notes would decline, but the fund's position in the interest rate swap would compensate. Likewise, there is a good but not perfect case that if default or significant deterioration in ABC Corp.'s senior unsecured notes should occur, its common equity shares should be impacted significantly as well. For example, since senior unsecured notes are senior to common equity in bankruptcy, the prospect of default on notes should mean that the firm's financial resources are so exhausted that common equity shareholders have possibly been wiped out. Thus, if additional financial deterioration for ABC Corp. occurs, the senior unsecured notes may decline in value; this should be compensated by the increase in value of the put option. Hedge Fund XYZ has insured against credit risk. Next, Hedge Fund XYZ may also increase the magnitude of this position by taking on leverage. If the senior unsecured notes have a yield to maturity of, say, 10%--resulting from having a yield of 8% but then affected by a discount on the notes--the hedging positions taken above might, hypothetically, reduce the yield to maturity to 9%. Hedge Fund XYZ could then attempt to attract leverage to magnify this return. If Hedge Fund XYZ can borrow up to 50% of its position at a 3% interest rate through margin (taken from IB), it should be able to increase the return from 9% to 12%. Of course, this is not to say that I have run the numbers of any specific junk bond to see if this opportunity is out there. It's just an example of the position a hedge fund might take if it believes junk bonds are undervalued relative to other securities, and how it can generate alpha this way without taking on inordinate amounts of credit and interest rate risk. I have the same fund in my work retirement plan. With the lower expenses (.50% vs. the costlier retail version, I think retail is about .75?) I do invest some money in it, although that would make me in a tiny minority here. It has more international content than Vanguard's fund (or most others, I think.) It's had an okay long-term record but hasn't done as well lately. In theory maybe you can make an argument for the fund eventually declining to a near-zero NAV. As a practical matter I think the low-ish values become a problem at some point, so maybe the funds will have to deal with that eventually, although values have been lower than they are now. Well, funds can declare reverse splits which (e.g.) doubles their price per share by halving the number of total shares. Just take a look at the history of, say, TVIX: . . . . I do agree with the premise that high yield is unnecessary, but this compares a 70/30 AA with a 60/40 AA. Asset allocation is a more predictor of returns than asset classes. I think EM bonds have better odds of being undervalued due to home bias and a seeming lack of an equivalent to the equity arbitrage play, and they can play the same role as corporate junk bonds in a portfolio. There's a common theory that high yield bonds incorporate higher equity-like credit risk, so some would allocate to a new high yield bond position taking from both equity and investment grade bonds. Ideally you would try to compare across multiple allocations to see how risk/return has been affected, e.g. seeing how taking only from bonds affects outcome, then both, then seeing what %s resulted in the same sharpe, stdev, and return as a traditional stock/bond allocation. I know what I think the answer is. If I wanted diversification into HY bonds I'd probably choose hedged (to USD) EM bonds vs USD junk bonds. Yes. Excluding an asset class (or significant market segment) does not seem to be consistent with broad diversification. To believe the market is pretty efficient and things are generally correctly priced, other than HY, lacks a certain something. It's called "capital structure arbitrage". A corporate bond is equivalent to a risk-free government bond plus some extra yield to compensate for credit risk. This extra yield varies based off how the market evaluates the risk of default. This risk of default also shows up in the company's stock price. So, you can get offsetting equity and interest rate positions to get just the credit risk that is "underpriced". Typically, it's mostly downside equity price movements that are correlated with an increased credit spread. So, hedge funds will typically either buy put options or short the stock and buy call options, depending on the specific economics of each choice. Anyhow, the example: suppose you're a hedge fund and you think company XYZ's five-year bond is "too cheap", and their stock is trading at $100/share. You buy $100k of the bond, short the 5-year treasury futures contract, sell 1000 shares short, and buy 10 XYZ call options struck at the $100/share mark. If the 5-year interest rate goes up 10 basis points, you lose $500 on the bond and gain $500 on the futures contract. If the company turns out to be Enron and the bonds are worthless, you lose $100k on the bonds and gain $100k on the short sale of worthless shares. If the company makes a ton of money, the call options let you close out the short position without taking a loss, and the company's creditworthiness improves, making you some money on the bonds. Since stock is more price-sensitive to bankruptcy than bonds are, pretty much the only way this trade can lose money is if you wind up paying more for the call options than you get from the credit spread of the bonds. (Technically, the company's stock price can stay the same while their creditworthiness declines. But that implies that the company is riskier, which means that the call options you own are now worth more, so as long as you have enough time value left in them you're still OK). High Yield bonds are mathematically a combination of risk-free bonds and credit risk with a high correlation with the underlying stock's price. There's much less free lunch than you'd think due to this correlation. At the same time, high yield bonds are less capital efficient at getting desired returns than stocks are. You can't eat risk-adjusted return, which is exactly what diversification gets you. Your choices are either to use leverage (which has significant risk of operational errors for retail investors like us), or to end up with less money than an all-stock portfolio would get. "The market" buys them and values them, so presumably the market "believes" they have a use in a portfolio. If you are better than the market at determining what should be in a portfolio, then it makes perfect sense to take advantage of that. I once found this quote: "there is a wonderful computer for examining risks, returns, correlations, news, rebalancing principles, etc. to create a properly diversified portfolio. It's called the market. Beware of thinking you're better at picking a good mix of securities." How much of a difference it makes in practice is hard to know in advance. Had a family member who took a risk and bought Vanguard High Yield during financial crisis at $3.50 ish or so and rode them all the way back up (while collecting an incredible dividend cash flow stream the whole time). Market timing and security selection. I stayed the course however. There is an information asymmetry between the issuers of junk bonds & investors that reminds me of the IPO market. In essence, the issuers of junk bonds will issue them when the Option Adjusted Spread, the Credit Spread over safe bonds is low (implied volatility is low). The market is underestimating the credit risk compared to the insiders' view. If the bonds get upgraded then the Investors get their money back due to refinancing clauses - their upside was capped by that, and the yield they go was too low (because the issuers have an information advantage). On the other hand if the bonds default then they were not compensated enough. Credit markets have these cycles, and as an investor one is at risk of investing when the insiders are selling (issuing more bonds) only to reap the risks when the market is overestimating the risk of default. Current credit market conditions, record corporate debt loads, cov lite lending etc. lead me to think we are closer to the "not risky enough/ underestimate" rather than the "too risky/ overestimate" condition. It seems an inefficient way to get Credit Risk as a return factor in the portfolio although granted it's not obvious how else the individual investor can get that. To me the junk bond market looks like another version of the IPO market. Issuers know things investors don't. Issuers can time to issue when implied volatility is low (credit spreads are low). Then it's tails they win, heads investors lose. Because if the bond gets upgraded the investors will get redeemed/ refinanced. But they haven't necessarily been paid the yield premium for that risk, because the bonds tend to be issued when spreads are low (and investor protections are relatively weak). (there's also a problem of tax inefficiency. The investor either consumes tax exempt space that could be used for more attractive assets OR it's a very tax inefficient investment in taxable). One is really trying to capture credit risk as an additional return factor, orthogonal to the other main portfolio factors (value size min volatility momentum etc.). I am not sure there's enough meat in that sandwich to make it worthwhile. I agree that if there's an anomaly, it's a structural one, around BBB because of the bond market distinction between being High Yield and being Investment Grade. And that that anomaly would not necessarily get arbitraged away because it is structural. And Hyman Minsky looms in my mind. Individual risk is hedged away, so that begats greater systemic risk - the background radiation of financial risk rises. That's what corporate credit markets feel like now. Again my puzzlement is how one could look at say call options on junk bonds and decide these were mispriced in the issuer's favor, but be able to see that call options on investment grade bonds (loads of them in typical total bond market funds) are not, if you think they are not. Or, simply that the high valuations in the stock market don't have a 'bad feel' also. Or maybe you do. But the point I'm making is really about the general atmosphere of discussion on this forum about junk where sometimes people make statements like yours which basically must mean the junk bond market is inefficient and/or can be timed and people go 'hmm, maybe so', vs. the storm of opposition and derision if anyone implies either thing is true of the stock market. Again, the historical evidence quoted seems to show riskier US corporate bonds gave better risk v. return than higher quality ones. It's not just that BB was best, it's that AAA-A were worse over the longer period given in the above reference, though very weak junk (CCC) was very much the worst over a shorter period more dominated by 2009. Can you point to a reference countering this in general, or for example specifically quantifying how issuer call options in junk are more undervalued by investors that call options on investment grade, or any other options in the market? Tax inefficiency of risky bonds in taxable accounts is obvious, but a lot or most discussion on this forum assumes tax deferred. The last statement I already explained that I agree with: for investors seeking relatively a lot of risk without leverage there is not much point in risky bonds. For portfolio's with lower stock % and leverage on bond risk it can be shown that the higher historical Sharpe Ratio and <<100% correlation of the Vanguard junk fund with stocks and treasuries would have added noticeable though not dramatic benefit to some portfolio's historically, subject to the vagaries of all historical references (differing periods, the future may not be like the past). I am unsure if this has changed or been simplified since that time. A pause there. Investment grade corporate bonds do not usually have refinance options held by the issuer? Whereas if HY bond issuers reach IG then they generally have the right to pay the investors money back? So I am taking it that you mean the credit spread? I.e. the Merton model of a corporation issuing bonds? If the value of the firm falls below the value of the debt of the firm, the equity holders just walk away? Swensen has an argument about the problem with corporate debt in general & asymmetric information. It seems to me these problems are potentially worse with HY bonds. I am not aware that the evidence shows a superior risk-return tradeoff for sub IG bonds than IG ones? Except there's that anomaly at BB? Do you mean a "risk parity" portfolio? The chapter on the subject in Expected Returns by Antti Ilmanen seems to imply that BB and B bonds have had better risk adjusted return than IG but CCC were worse. Of course it is possible for this to be the case and them to still not have a place in stock heavy portfolios. I find it interesting that millenials were so spooked during the last recession many got out of stocks and haven't got back in...but youngins are gonna consider a junk bond which lost 30% between 10/01/07-12/5/08 (link above)? Do they really know what they're buying? I'll readily admit I made the same mistake when I was in my 20s. I remember the Vanguard associate on the phone trying to warn me against buying them. I thought high yield sounded good. Why wouldn't I want that? As I learned more, I came to understand the Vanguard associate was trying to help me help myself. Sometimes we can be our own worst enemies without even realizing it. 4. it was undiversified (had municipal bonds only, no corporate, not government, etc). I was able to convince her to stick with her boring old total bond market index fund and her stable value fund and not follow her friend's stretching for yield. I explained the concept of total return. She got it. Her friend never did. I'm sure he's been happy over the past many years, but we'll see what happens during the next recession. Then he'll probably have some regrets. Where does this data come from? Basically none of them had any money invested. The very oldest millennials were in their mid 20s in 2008.
it's not that they had "no money invested". They may have had little money invested. But despite a large loss on a small amount invested being small losses, they obviously weren't expecting their investments to go down, or down by that much (50%) if they were mostly in stocks. If they learned this early in their investing careers this is no bad thing. Memory of bear markets helps with exuberance. BTW the "Millennials" were 18 in 2008? So not investors in stock markets? When does Millennial start in terms of birth dates?